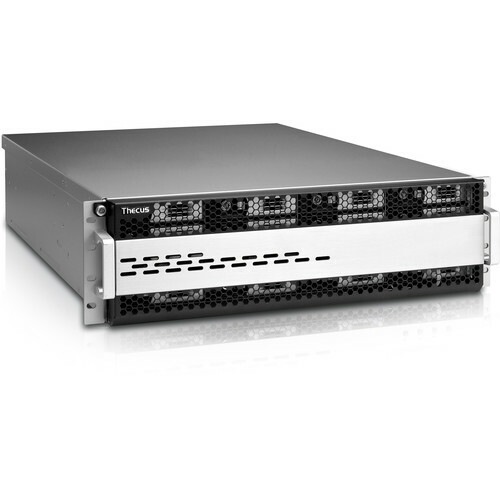 The Thecus W16850 NAS Enclosure grants you access to sixteen storage bays and four Gigabit Ethernet ports to create a storage pool of data for networked systems. The sixteen bays support standard and enterprise-grade HDD and SSDs with a SATA or SAS interface, while a LSI HBA card provides RAID support for increasing the drive's performance and redundancy capabilities. You would need to purchase a license to activate the Windows Storage Server 2016 operating system. To manage the OS, apps, and data, the W16850 is armed with a 3.4 GHz Intel E3-1231 v3 processor along with 16GB of DDR3 ECC memory. Other notable connections include four USB 2.0 and two USB 3.0 ports as well as VGA, PS/2, expansion, and RS232 ports. Powering your drives and the W16850's components are done by a redundant 500W power supply. In addition, four hot-swappable fans are on board to cool the internal components and drives. Windows Storage Server 2016 Standard provides a secure network infrastructure and reduces costs while increasing technological flexibility and value within your organization. The operating system requires a sold-separately license to activate. This Thecus NAS is 10Gb Ethernet ready by allowing you to install a 10Gb NIC into one of the available PCIe slots. The 16 bays support enterprise-grade HDD and SSD models. This NAS features support for internal hard drives with SATA III or SAS 12G. The SATA connection transfers data at speeds up to 6 Gb/s. It is also backwards-compatible with SATA II, so your old disks can be swapped in and out without a hitch. Whether connecting digital cameras and smart phones, backing up large external hard drives, or extending the capacity of your NAS, USB 3.0 will transfer data at up to 5 Gb/s. Backwards compatibility adds the connectivity of USB 2.0 and USB 1.1 devices to achieve universal access. Box Dimensions (LxWxH) 33.0 x 23.35 x 12.0"